Not every exception means bug in your application. Certainly, EAccessViolation or EDivByZero is always some bug, while EAbort is never a bug. And there are some exceptions which may be or may be not a bug. For example, EStreamError exception may be a bug in your file processing code. 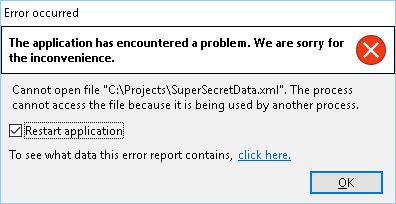 But it also may be due to malformed source file (e.g. external environment), thus it is not a bug in your code. • When your application raises exception as normal part of processing (e.g. 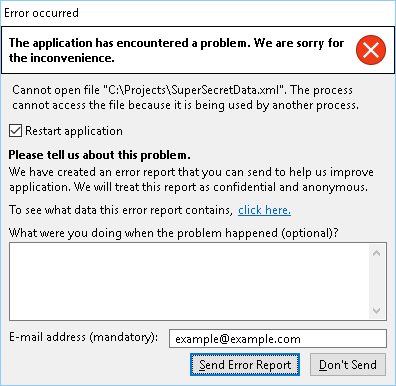 not due to bug): you want to show dialog about exception ("error message"), you do not want to produce bug report, nor send it. Exceptions that do not represent a bug in your code are called "expected exceptions". When EurekaLog processes expected exception: it disables creation of bug report, send and restart features, as well as showing technical details (call stack, etc.). Basically, processing of expected exception will only show the exception message to the user and nothing else. "Help" button with launch your application's help system with the specified context ID or launch a default web-browser to open the specified URL. It is supposed that the context ID or URL are pointing to your help system which should explain user what this exception means and how he can continue. If you do not want this behavior - simply use -1 as context ID (the default choice). You can mark any exception as expected via various methods. Please see this article for examples of each method. • How to mark exception as expected?